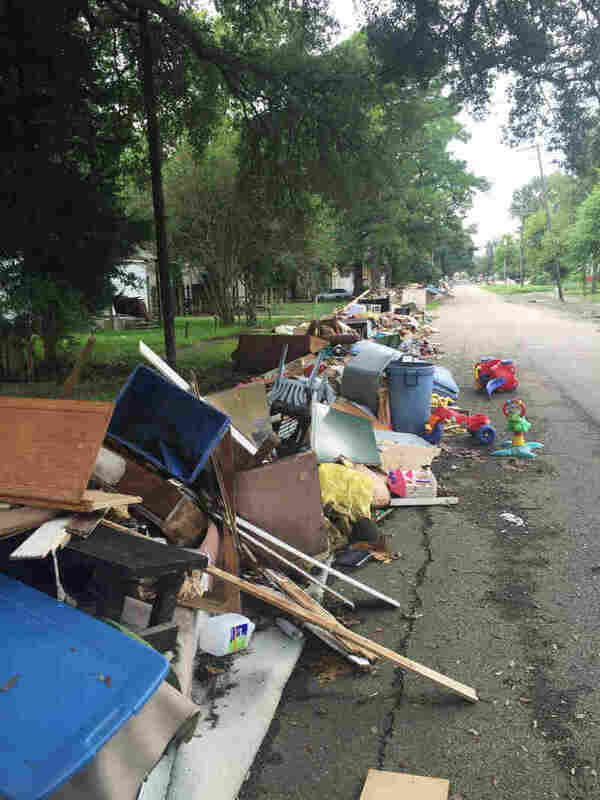 Louisiana Kids Return To School, A Bubble Of Normalcy After Massive Floods Children in Baton Rouge, La., are back in class after a three-week interruption. But life is still upended: Many students are displaced and still living in shelters, and don't know where they'll go. 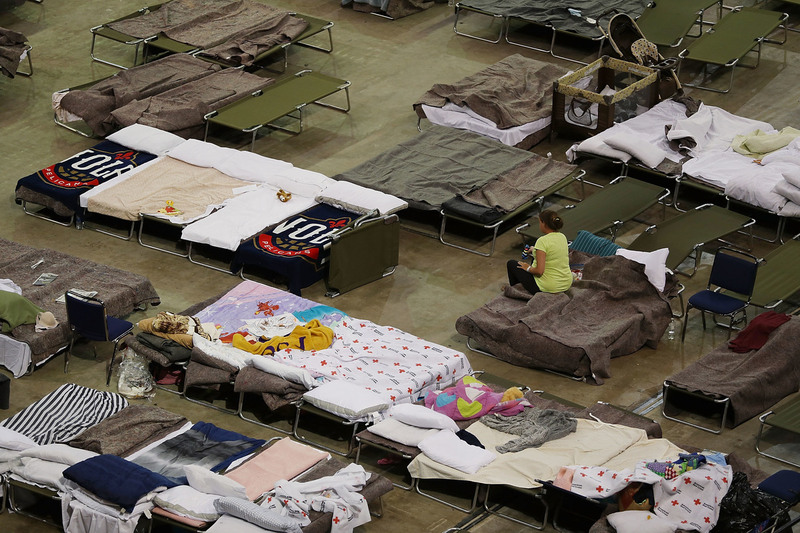 Evacuees sleep in cots on Aug. 19 at the shelter set up at the River Center arena in Baton Rouge, La., as the area deals with the record flooding. Things are far from normal for people in Louisiana hit by last month's historic flood. Thousands have lost their homes, their cars, their jobs. But one routine resumed this week in Baton Rouge: Students are back in class after a three-week interruption. At Claiborne Elementary in north Baton Rouge, kids are tussling on school playgrounds again, even as their families' soaked belongings lay in heaps along neighborhood streets. Every available space at the school has been converted to a classroom. The campus is now hosting students displaced from Howell Park Elementary, about 2 1/2 miles away. The goal is to keep it normal even though the schools are merged, says Rochelle Anderson, principal of the host school. "We wanted to make sure that the students walked into the school that was very structured," she says. "Regardless of the disarray, once you walked through the building, that disarray would somehow diminish." Flood-damaged debris lines a street in Baton Rouge near Claiborne Elementary, which is reopened and hosting students displaced from a nearby school. Every class has its own room; there's no doubling up. And the usual classroom rules are in place. But Anderson says the school is being more lenient about uniforms and supplies washed away in the flood. "We just want them here, in that school. And we'll take care of the rest," she says. "We'll feed them, we'll clothe them, we'll give them supplies, we'll love them. But more importantly we're going to teach them." Anderson is displaced herself and lost her vehicle in the flood — one of about a third of staff members in the East Baton Rouge Parish school system affected. Systemwide, structural damage is estimated to top $50 million. The school system lost one-third of its bus fleet, and food worth more than $70,000. Twelve schools are in the same position as Howell Park Elementary, now meeting elsewhere. The principal of Howell Park, Rochelle Washington-Scott, says her school is now a construction zone. "They're still trying to get rid of mold and go through things to see if there's anything that can be salvaged," she says. "So right now all we know is that we're at Claiborne until further notice." She makes the rounds to make sure her teachers and students are comfortable in the new setting. The biggest issue has been transportation, she says. Most of her students walked to school but now they're spread out across the region, with no place to call home. Washington-Scott says Howell Park families were predominantly renters and are having a hard time finding housing now with rental properties in short supply after the flood. "That's been the painful part of it," she says. "That's why we've been making it such a big deal for a school to be the haven, the safe house, the place where at least if you know your baby is here, they're fine until you figure out what you need to do as far as living arrangements go." The living arrangement for nearly 100 East Baton Rouge Parish students means passing through a metal detector at the River Center downtown, the city's emergency shelter. Sarita Fritzler with Save the Children says the situation takes a toll on kids. "At first it might be exciting to be living in a shelter, to be meeting this new surrounding," Fritzler says. "But now we're seeing children who are just anxious. What's next? Where do we go next? They've seen people come and go, and they're still here." For the three weeks that school was interrupted, Save the Children operated a space in the shelter for kids to play games and do arts and crafts — and have somebody to talk to. Now it serves as an after-school program. Worker Patricia Duncan is at a table molding play dough with 11-year-old Talesha Coleman. In her first day back in class, Talesha says they wrote stories about what has happened since the flood: She wrote about living in the shelter. Louella Coleman is the girl's grandmother. "That's my little grandbaby. That's Talesha. And I tell her we just keep it positive," she says. Coleman, who is raising Talesha and her 6-year-old sister, is disabled and uses a walker to get around the shelter. She has a bright scarf wrapped around her hair, and a wide, warm grin despite her predicament. "I never let 'em take away my glory," she says. "I keep a smile on my face 24 hours no matter what." The family has been living at River Center since Aug. 12, when her rental house was flooded and she lost everything. "I've just gotten to a point where I just leave it in God's hands now," Coleman says. "That's all I can do." She is glad to have the girls back in school; she calls herself a "diehard" for education. But things are off to a rocky start because the first-graders' bus hasn't made it back to the shelter, and it's now after 6 p.m.
"She's not here yet," Coleman says. "For them to just have her sitting there at the bus terminal, it's frightening to me, because she's just 6. She's not used to that." The aftermath of the flood means dealing with a lot that people aren't used to: The River Center shelter will be closing next week, and Coleman has yet to find a place to live.